Introduction by Foster, Carter E.
Over the course of more than 30 years, Roni Horn has developed a body of work of concentrated visual power, classical in its restraint, beauty and sensitivity to material. Horn's pieces invite conceptual engagement, though her practice defies easy categorization, and also elicit in the viewer a refreshed attention to matter itself, to make being here enough (as the title of a previous monograph put it). Her subtle explorations of the complex energies between object and subject have expanded the vocabulary of every medium in which she works. This slipcased, two-volume set accompanies the most comprehensive overview of Horn's work to date--which opens at Tate Modern in London in February 2009 and then travels to New York's Whitney Museum of American Art in November of that same year--and has been overseen by the artist herself. The first volume includes a plate section of works in the exhibition with an essay by Briony Fer; the second volume, the subject index, is fully illustrated and includes texts on a variety of topics related to Horn's work by a host of prominent artists, critics, curators and cultural figures, alongside the artist's own writing. 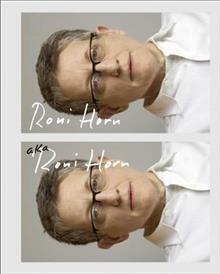 Born in New York in 1955, Roni Horn achieved international recognition in the 1980s, and her works have been the subject of numerous major exhibitions since. In 2007, she undertook Artangel's first international commission, creating Vatnasafn/Library of Water, a long-term installation in the town of Stykkisholmur, Iceland. She has had solo exhibitions at numerous leading art institutions, including Inverleith House, Edinburgh (2006), Fotomuseum Winterthur (2003), The Art Institute of Chicago (2004), Folkwang Museum, Essen (2004), Centre Pompidou, Paris (2003), Dia Center for the Arts, New York (2001-02) and Museo Serralves, Porto (2001).